Alcohol or drug abuse is diagnosed when substance use interferes with functioning at work, at school, and in social relationships. It is also diagnosed when substance use creates or worsens a medical condition or when substance use occurs in dangerous situations. Alcohol or drug dependence is a more severe condition than alcohol or drug abuse. In addition to facing more negative consequences, people with dependence have failed in their attempts to abstain from or control their use of substances. In some cases, physiological dependence may also exist, which is indicated by heightened tolerance (needing more of a substance to get the same effect) and withdrawal (experiencing symptoms such as tremors or nausea when substance use has stopped). Co-occurring disorders can sometimes be difficult to diagnose. 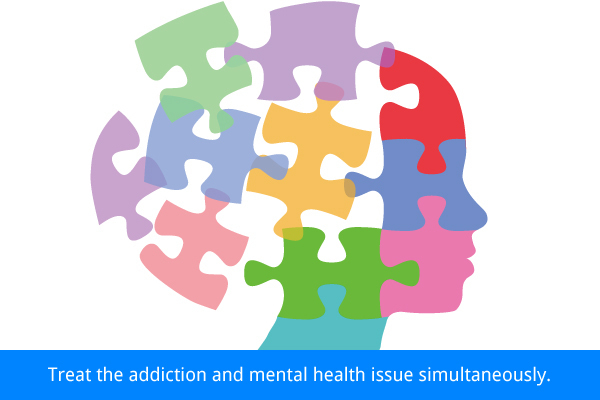 Symptoms of substance abuse or addiction can mask symptoms of mental illness, and symptoms of mental illness can be confused with symptoms of addiction. People with mental health disorders sometimes do not address their substance use because they don't believe it is relevant to their problems. A worsening of mental health symptoms even while receiving treatment. Those diagnosed with mental health disorders often use substances to feel better. People who are anxious may want something to make them feel calm; people who are depressed may want something to make them feel more animated; people who are fearful of others may want something to make them feel more relaxed and less inhibited; and people who are in psychological pain may want something to make them feel numb. Using alcohol or other drugs not only fails to repair the mental health disorder but also prevents a person from developing effective coping skills, having satisfying relationships, and feeling comfortable with themselves. Alcohol also interferes with medications prescribed for mental health disorders. In short, drug and alcohol use makes mental health disorders worse. Alcohol or substance use problems that seem resistant to treatment. People with co-occurring disorders may stop using alcohol or other drugs, but they will find difficulties as the symptoms of their mental health disorders persist. Treatment centers and clinicians and addiction specialists may not be prepared to address both conditions. And some traditional peer recovery groups may insist on abstinence from all drugs - even medications prescribed for mental health disorders. As a result, people with co-occurring disorders find it very difficult to treat their substance-use problems without also treating their mental health disorders. Although in the past, mental health disorders and addiction problems were often treated separately, we now know that co-occurring mental health and substance use disorders impact one another and must be treated together. Treating just one disorder will not cause the other to automatically improve. And separate, parallel care for the disorders does not result in one, effective treatment plan. To be effective, both disorders must be treated at the same time, in the same place, by the same treatment team. This is called integrated treatment. 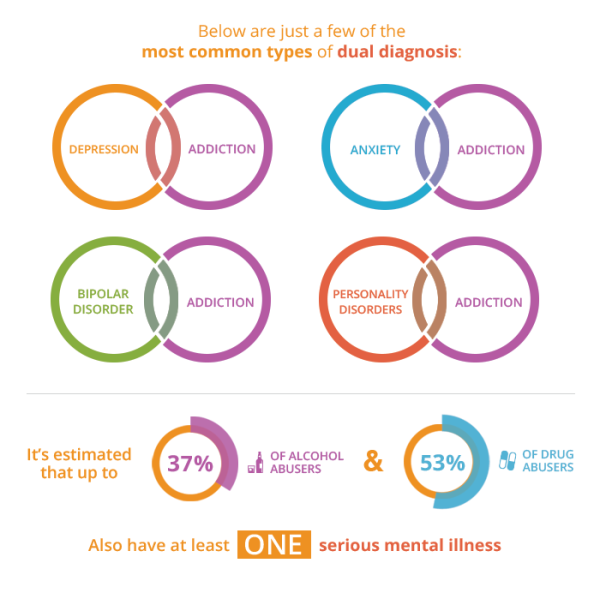 Being diagnosed with a substance use disorder and a mental health disorder is often referred to as having a dual diagnosis. The disorders together are called dual disorders or co-occurring disorders. 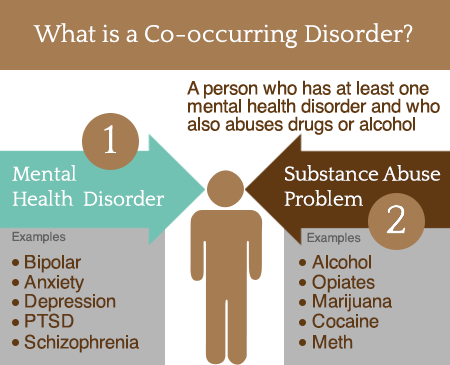 Co-occurring disorders are common among people seeking treatment in the mental health or addiction treatment settings. Although people with this diagnosis may not have received treatment for both disorders, co-occurring disorders are, in fact, common. In a 1990 survey of over 20,000 U.S. adults, over half (53%) of those with a drug use disorder also had a co-occurring mental health disorder. A little over a third (37%) with an alcohol use disorder also had a psychiatric disorder (Regier et al. 1990). Among people with schizophrenia or bipolar disorder, the rates of co-occurring disorders appear to be even higher. About half of people with these diagnoses also have substance use disorders. According to the 2006 National Survey of Drug Use and Health, 5.6 million people in the United States have co-occurring substance use and mental health disorders. There appear to be genetic risk factors for substance use and certain mental health disorders, but genes alone cannot explain all cases of these disorders. Scientists cannot fully explain why some people develop mental health disorders and others do not. One theory that has received support is the stress-vulnerability model. This model holds that both stress and biological vulnerability work together to contribute to symptoms of mental illness. Biological vulnerability refers to a tendency to develop a condition. People are born with or acquire this sensitivity very early in life. Vulnerability also refers to what a person has been exposed to early in life, such as exposure to a virus in the womb. Stress or environmental factors can trigger the onset of symptoms. "Stress" refers to the challenges faced in our lives. It is affected by our coping skills, social support, and involvement in meaningful activities. People with a mental health disorder may be more biologically sensitive to the effects of substances. They may also use substances to cope with symptoms or facilitate social connections. In general, people who have a mental health disorder are at much greater risk of also having a substance use disorder. It is not known why people become addicted to a certain substance and not another. Some research indicates that access and exposure to substances may be the most important reason. That is, the substances people have access to determine the type of substance use disorder they are likely to develop. In traditional care, mental health disorders and addiction problems are often treated separately. We now know that co-occurring mental health and substance use disorders impact one another and must be treated together. For care to be effective, both disorders must be treated at the same time, in the same place, by the same treatment team. This is called integrated treatment. Integrated treatment can stabilize the symptoms of co-occurring disorders and provide the foundation for lasting recovery from substance use and psychiatric disorders. A variety of treatment approaches are used in treating co-occurring disorders. 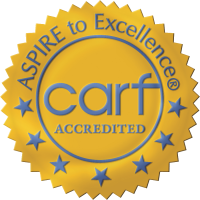 These include treatment for substance use and mental health disorders, client education, shared decision making between client and caregivers, peer support, training in coping skills, and recovery support. Research shows that an integrated approach to treating co-occurring disorders results in the best possible patient outcomes. The integrated treatment model addresses the problem of access by ensuring that one visit, in one setting, is sufficient to receive treatment for both disorders. It addresses the problem of combining messages and philosophies by giving this responsibility clearly to the treatment provider instead of the client. When both mental health and substance use services are provided by the same person or team, the client has one treatment plan, one set of goals, and one relapse plan. The need for communication across agencies disappears. Many people with co-occurring disorders do not come into mental health centers to seek treatment on their own. They might be on the streets, in homeless shelters, in police custody, or in jail or prison. 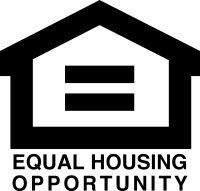 Assertive community outreach that uses specific engagement strategies is necessary to connect them to the help they need. Before people are ready to completely stop using substances, they are often willing to take some smaller steps to reduce some of the harmful consequences of their use. When people make progress on some of these [harm reduction] goals, they become more motivated to control their substance and mental health disorders. Some professionals argue that this approach enables an addicted person to continue to use and add that, because of this enabling, addicted persons will never experience the pain of their use and "hit bottom" so they can truly recover. For people with co-occurring disorders, however, not attending to the negative consequences of addiction often leads to death. Taking positive steps often increases motivation for recovery. 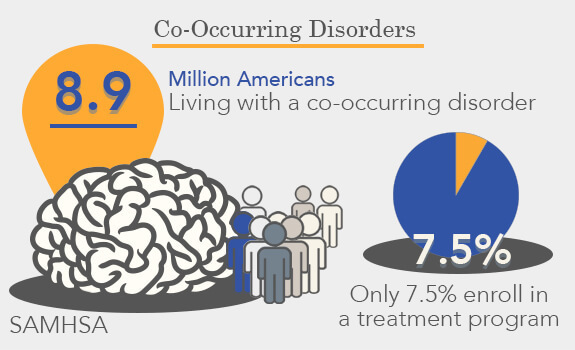 People with co-occurring disorders recover at varying rates. Research shows that some begin to manage their illnesses in a matter of months. Unfortunately, many people enter recovery gradually, over many years. This long-term perspective means that we must be accepting of different paths. We must never give up. We must accept that recovery can be a life-long journey. To effectively address a client's co-occurring disorders, treatment must target the client's stage of motivation for recovery. The idea of stages of treatment means that there are different interventions for different stages. The stages of motivation-based treatment are engagement, persuasion, active treatment, and relapse prevention. People with co-occurring disorders typically have multiple needs. Like everyone, they also have their own unique preferences and values. Needs, preferences, and values all influence their goals. Interventions, therefore, must be highly individualized and tailored to each client. Most clients engage in multiple interventions at the same time. For example, two young clients with schizophrenia and cocaine abuse could easily have different interventions. Person A might be bothered more by the interaction of schizophrenia and cocaine abuse and require residential dual diagnosis treatment plus attendance in Narcotics Anonymous. Person B might be bothered more by family problems and past trauma and need trauma intervention and family psychoeducation. Both might need supported employment.